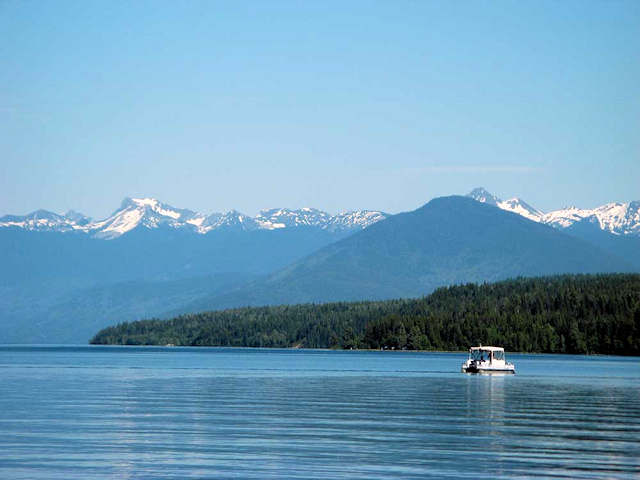 Plato Island Resort and Marina is set in the wilderness on the shores of beautiful Quesnel Lake, BC, Canada. Quesnel Lake is thought to be the deepest inland fjord lake in the world. Once, in the geological past of the planet, Quesnel Lake was an inlet and connected to the Pacific. From the west and the little settlement of Likely, with a fascinating Cariboo Gold Rush history, to the eastern reaches and the high peaks of Wells Grey Provincial Park, this is a true British Columbia wilderness lake, surrounded by forest and with secluded, long sandy beaches! The north arm of Quesnel Lake reaches into the snow topped mountains of the BC Rockies. The waters here are teeming with some very big fish; Rainbow Trout and Lake Trout. The Mitchell River empties into the north end of the lake here and it is not a rare occurrence to see grizzly bears roaming the banks, to catch spawning salmon during their annual runs. The salmon spawning runs in the local rivers are among the most spectacular in British Columbia. Quesnel Lake is famous for some of the largest Rainbow Trout in British Columbia. Trout fishing for giant Rainbows and monster Lake Trout is an experience that brings anglers from around the world. Plato Island Resort offers a full service marina on beautiful Quesnel Lake. Come and experience the majestic British Columbia wilderness at Plato Island Resort and Marina.